AMRAVATI, MAHARASHTRA - SEPTEMBER 12, 2018: Artist gives finishing touches on an idol of the Hindu god Lord Ganesha at an artist's workshop for Ganesha festival. 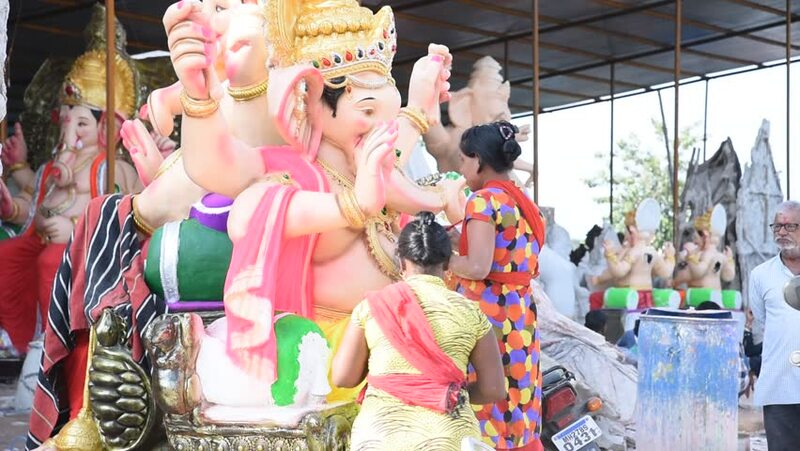 hd00:43AMRAVATI, MAHARASHTRA - AUGUST 24, 2018: Artist gives finishing touches on an idol of the Hindu god Lord Ganesha at an artist's workshop for Ganesha festival. hd00:14BANGKOK, THAILAND - October 2: 2016. Religious traditions,"Tan Kuay Salak" (thai name)at Wat Benchamabophit on October,who will receive a donation to receive the precepts and blessing from the monks. hd00:08Cusco, Peru - May 13: Native people of Cusco dressed in colorful clothing in a religious celebration for Nuestra Senora de Fatima. May 13 2016, Cusco Peru. hd00:15LAS PALMAS DE GRAN CANARIA, SPAIN - FEBRUARY 09: Participants in the Adult Costume Competition present their costumes during the Carnival, February 09, 2012 in Las Palmas, Spain.